Anyone who has heard about this book will know that it is a rollicking, raucous and bawdy tale. But that is not what this book is about. It is Chris Flynn’s debut ‘novel’, but the term ‘novel’ gives us no inkling of the content, structure or style of the book. It is impossible to categorise and hard to describe. Perhaps Flynn’s opening sentence helps give some idea of what to expect: The weird thing is, right, apart from the fact a good book can take the mind off of things like the past and that, is that I starts to speaking different. There are no quotation marks or other conventions to indicate speech and the use of punctuation is esoteric. This puts the reader on alert until the rhythm of the first-person narration mixed with dialogue becomes familiar and the reader is grabbed by the front of the shirt and dragged along for the ride. There is a touch of the self-conscious in the story, not because it is all about Billy’s self-examination but because at times I was aware of the author’s hand in the telling; it felt as if Flynn had an agenda in the course the story takes. While I was aware of this at times, I didn’t find it too intrusive or contrived. It was easy enough to allow myself the deceit that the narrator, Billy, had set out to tell his story in a particular way, and he succeeds in doing this. A Tiger in Eden is a story of past violence and its hold on a young man who desperately wants to walk away from it and expunge it from his mind, from his very being. He ‘escapes’ to Thailand but finds it hard to escape from himself. Part of this attempt leads him to one sexual encounter after another, some of them retold vividly and with great detail. Through chance encounters and some decisions made out of an attempt to change the course of his life, Billy finally discovers a path that leads him to redemption. The book demands a certain amount of suspension of disbelief for the reader to fully enjoy it, but we are frequently asked to do this by films and stage plays, as well as by other books. One area of possible disbelief for me was the language sometimes used by Billy and the ideas that the language represented – it seemed out of character with his background and (lack of) education. Suspend any such disbelief as you read this book and you will immerse yourself in it, and you will soon reach page 215 and wish that there were more. I found it difficult to put the book down to attend to the demands of my own life, reading it over only four days. With my background of psychotherapy, so much of what Billy experiences internally rang true and I would have been happy had Flynn explored some of these in more detail and made the book longer. 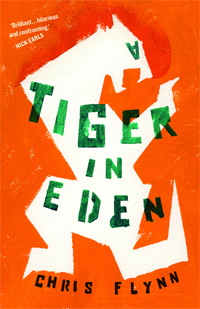 A Tiger in Eden is enjoyable, thought-provoking, educational, ennobling and revelatory.